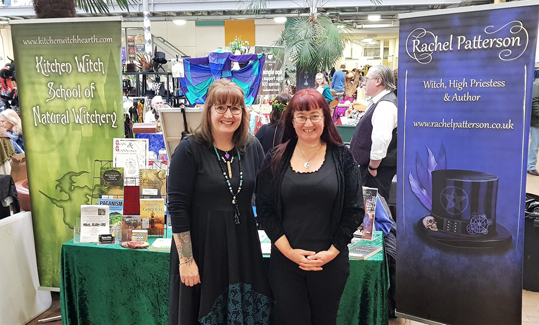 Rachel very kindly let me put copies of my book Pagan Portals - Candle Magic on her stall alongside her own books and several community titles we both contributed to, including Every Day Magic. Rachel is a talented and prolific author. Her latest book - Witchcraft...Into the Wild - is one of my favourites, while Grimoire of a Kitchen Witch is one of her best sellers. 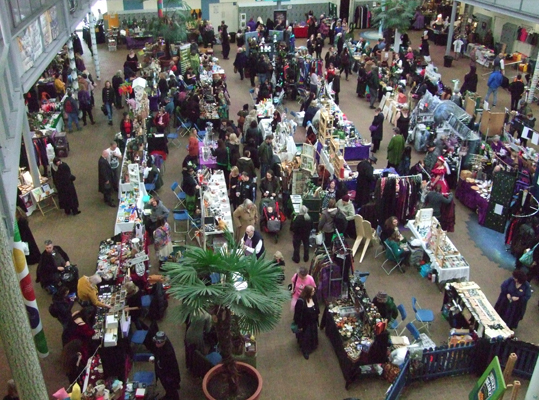 As well as having a huge space full of stalls offering all manner of witchy wonders, the Enchanted Market has talks throughout the two days of the event and musical entertainment late into the evening. Rachel and I were both giving talks. Her talk was on the Cailleach, while mine was an introduction to candle magic. I also met up with another Moon Books author, Cat Treadwell, who gave an inspiring talk called Living Your Magic. It partly drew on material from her book Facing the Darkness, about living with depression. I was delighted to meet up with two friends Jacqui Apostolides and Steve Apostolides who run Bewitched Botanicals and have regular stalls at pagan festival. 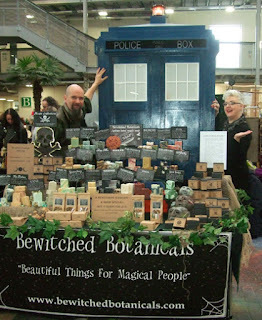 They make the most amazing soaps, with names like Undine, Smaug and Nevermore. Jacqui and Steve appeared to have travelled to the festival in a Tardis, as there was a blue police box standing right behind their stall. However, they said they had no idea who it belonged to. It just arrived there as they were setting up, but they hadn't seen who owned it. I suggested that if they did, they could perhaps hitch a timely lift home afterwards. Jacqui is also another contributor to Every Day Magic, and writes about herbal remedies. After a lovely lunch of vegetarian chilli, I listened to Matthew Callow's Neon Moon set in the auditorium. His album has just come out, but you can listen to the title track via a link I blogged about in the past. The photo at the bottom shows an overview of just part of the market, so you can get an idea of just how large the event is. The talks, workshops, auditorium and restaurant are off corridors at the sides, and there is also a hall for readings and another called Steampunk Alley. It was the first time I had been to the Enchanted Market. Being west of London, it is a bit of a journey for me coming from south east London. However, I had such a good time that I would happily go again - maybe even for both days rather than just the Saturday next time. I thought you were sisters when I first looked.